Another movie I recently saw with my wife was the "kind of prequel" to the Aliens movies- Prometheus. Can it match the awesomeness of Aliens? Of course not, but can it come close? There will be spoilers, but I imagine most people that care about it have seen it. If you haven't...well, read the review anyway. You will learn why by the end. So, where to start? The movie seems like it is a large collection of independent scenes put together. Or more accurately, like lots of linking scenes were cut out. I think they had ideas of what they wanted to happen, but instead of working out which to use, they just shoved them all in there and hoped it would work. It didn't. A lot of the movie is just a jumbled mess of ideas that just don't fit together as well as they should. This movie was made (beside to get large sums of money) to give backstory to the Aliens franchise and answer some questions that no one wanted answers to. Where do the Aliens come from? Did anyone really care? They could have just been the natural inhabitant of some planet, but now they are some disease/biological weapon made by some people that also made humans. Yeah, it's as dumb as it sounds. There's tons of plot holes and it actually generates more questions than it attempted to answer. They tried to answer just one measly question, but didn't even really do that. They just made the backstory worse and more convoluted than not having one at all. So an alien race made humans on Earth and visited 35,000 years ago and up to 2,000 years ago. Both humans and the "engineers" have the exact same DNA, despite how much 2,000 years would change that. They also left clues to where they wanted people to find them. The clues lead them to a bioweapon facility however. So...why lead them there, when the movie states they were going to take the stuff to Earth? One "Engineer" as they are called, gets really made when humans show up. No explanation for it, he just starts killing people so they can have one survivor, in true horror movie fashion. And what about the Aliens that people wanted to see? Well, there's this black goop, that can make...facehugger snakes. It also makes people into zombie creatures, so...yeah. I wish I were kidding, but I'm not. The facehugger snake has the trademark acid blood, but doesn't actually make the aliens, so...where do they get it from? As a bonus, here's the path that it took to get close to the xenomorphs that are commonly called "the Aliens". The black good gets injested by one of the stupid scientists on the ship. He then impregnates a barren woman before he starts mutating into a zombie. She cuts the creature out of her body and tries to freeze it. 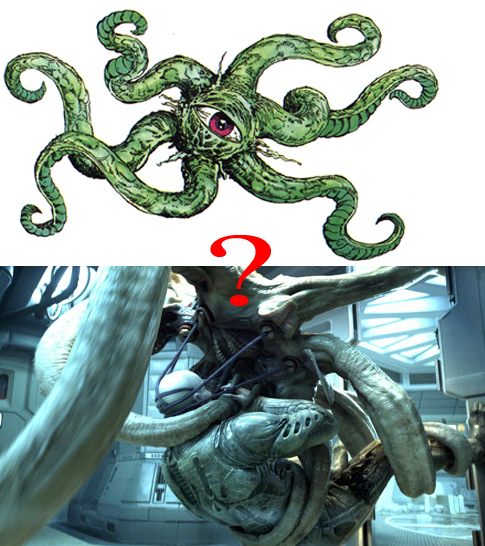 It then grows off screen into Shuma Gorath and ends up "facehugging" the engineer that inexplicably wanted to kill everybody. Out of its (his?) chest, the xenomorph emerges. Granted the actual Aliens life cycle is almost as complicated, but it's just silly. It also probably started with the idiot engineer drinking the black stuff in the beginning of the movie, but they don't bother to connect that scene to the rest of them, so who knows? It's honestly just not a good movie, from either the standpoint of it being a movie or being a movie in the Aliens universe. It doesn't flow right, it doesn't make sense but somehow has lots of predictable events. There's a lot more I could make fun of, but it's just faster to watch the Honest Trailer for it. It's funny and way better than the actual movie. Prometheus is just a boring two hours that I can't get back. I have to make fun of it with my wife to make that time worth it, and that's a really sad thing to say about a movie.